The Outback version has a number of features that enhance 'off-roadability'. It is a cook's kitchen, with lots of bench space for food preparation, backed up with large-sized appliances. The living space is refined and comfortable. The stainless steel tool cabinet. Bill Savidan checks out Jayco's Toyhauler Basestation 23.73-6 OB — a big vehicle that is part caravan and part mobile garage. From the front, the Toyhauler Basestation 23.73-6 OB looks pretty much the same as any other large Jayco caravan, except that it's higher off the ground. The model reviewed is the 'Outback' version (see the 'OB' at the end of the name). It's when you walk around to the back of the 'van you see it's different. Instead of a sleek moulded rear panel, you find a full height door, hinged at the bottom. 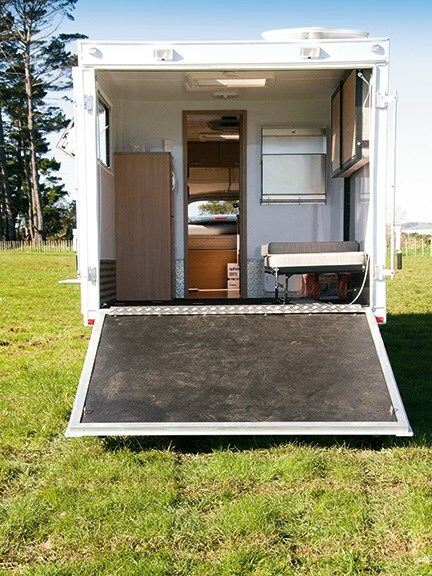 When lowered, restraining cables on each side hold the door level with the caravan floor. 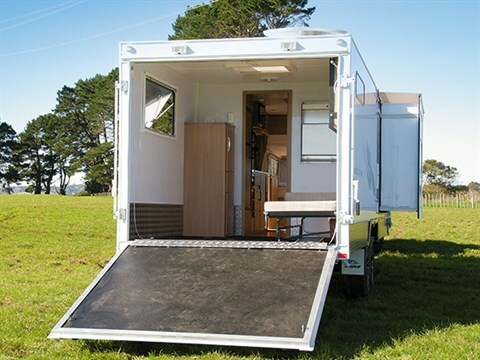 These cables can be disconnected so the door becomes a ramp from the ground to the caravan floor. Essentially it is designed to carry, store, and service 'things' like, for example, small inflatable boats, motorbikes, and go-carts. Back in Oz (where the Jaycos come from) the space has been used for work activities — a mobile office, and a portrait photographer's studio. 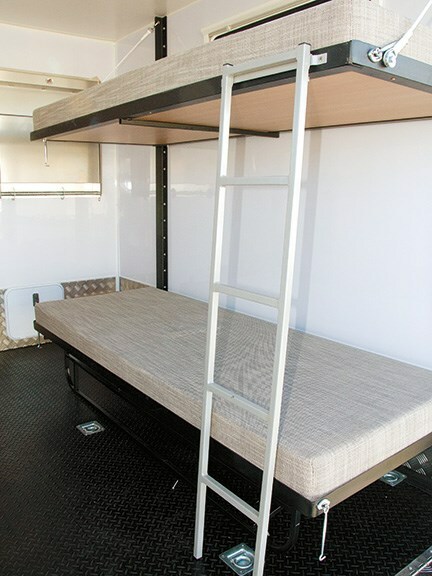 In standard configuration there are upper and lower fold-up beds on the driver's side. 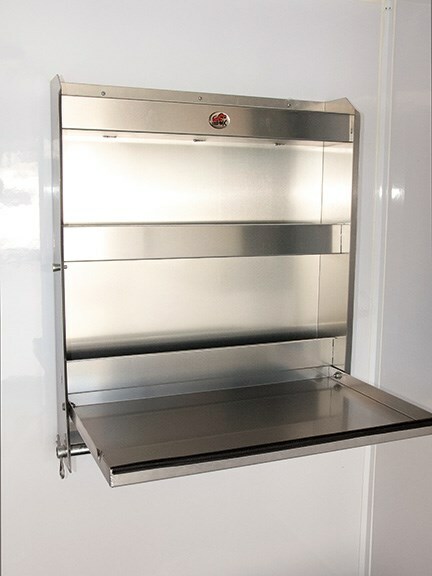 On the bulkhead wall is a 'mechanic's rack'— a stainless steel cabinet with a drop-down door that doubles as a workbench. Personally, I thought it would make a pretty good cocktail cabinet. The floor is covered with a practical, durable, black rubber-like surface with a non-slip checkerplate pattern. There are a number of tie-down anchor points set into the floor. A sturdy walkway leads through to the living area of the caravan. It is a space for the boys to carry, store and service their toys, and sleep with them too, if they choose. One feature of the Toyhauler that got my imagination running at turbocharged speed was the insect screen that lowers to close off the large rear garage door opening. Thoughts of a balmy moonlight night in a secluded bush setting, the sound avalanche of crickets chirruping, while I nestled under the bedcovers with the doors wide open, knowing the bitey bugs were being kept at bay – heaven. The bathroom is compact and functional. 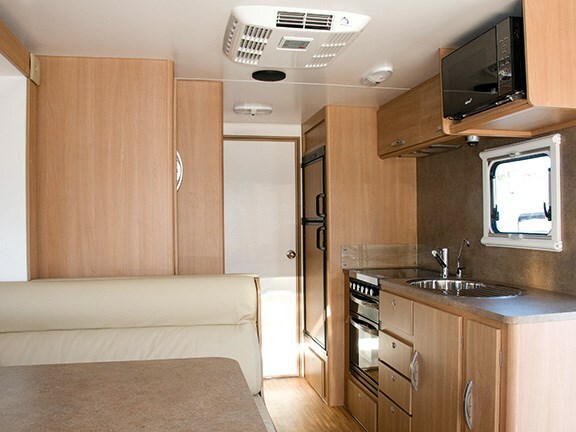 I think it's fair to say the bathroom reflects the design brief for the Toyhauler – function rather than form dictates in most parts of the caravan. 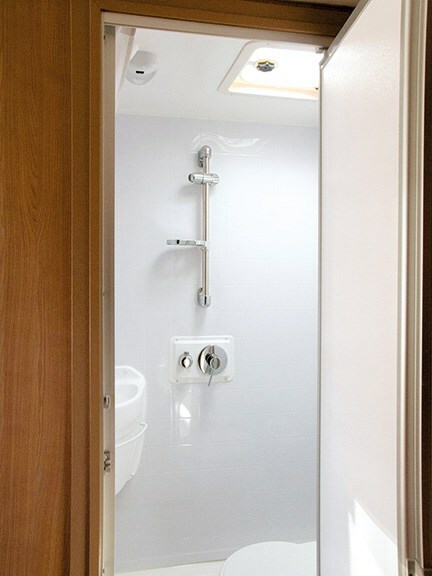 There is no separate shower, as the toilet and handbasin are in the shower stall. The walls and fittings are designed for easy cleaning after the shower has been used. It is a functional, no-frills bathroom. The Basestation’s kitchen is a cook's kitchen, with lots of bench space for food preparation, backed up with large-sized appliances. The Dometic fridge/freezer is a two-door 186-litre model. The oven has a separate grill and the cooktop has one electric and three LPG hobs and is topped off with a range hood. The built-in microwave comes into its own when 230-volt power is available. Although the kitchen bench is located on the route through to the garage, the passage is wide enough for passersby not to annoy the cook. The storage will eat up the largest supermarket shopping spree, so most cooks should be more than happy with the kitchen. The slide-out opposite the entry door moves the lounge seating outwards 550mm, creating extra space for dining and entertaining. And in the morning when the crowds have gone and you have the place to yourselves, there is plenty of room to spread out to read the Sunday papers before the rest of the gang arises. 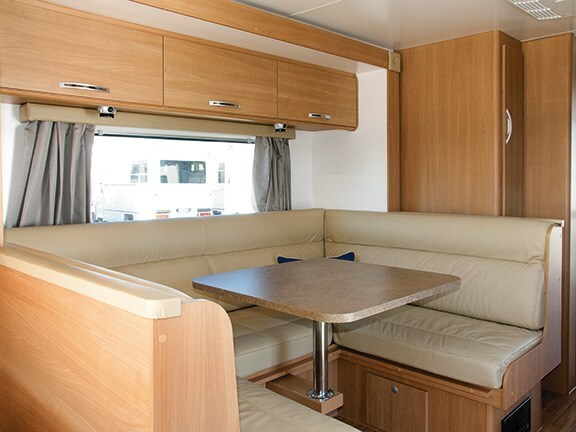 The Basestation 23.73-6 OB reviewed had the optional leather upholstery, while the standard trim offers a choice of seven hardwearing fabric colour schemes. One unusual feature is the table pedestal. A solid steel support protrudes horizontally from the front of the lounge seat about 150mm above the floor, to form the pedestal base. I thought it would be a certainty for the prize of 'shin-wrecker of the month'. As it turned out, when I sat at the table, I didn't even notice it was there. Just to the left of the entry door is a handy storage cabinet that also serves as a bedside table for the front double bed. This bed arrangement is a bit unusual. 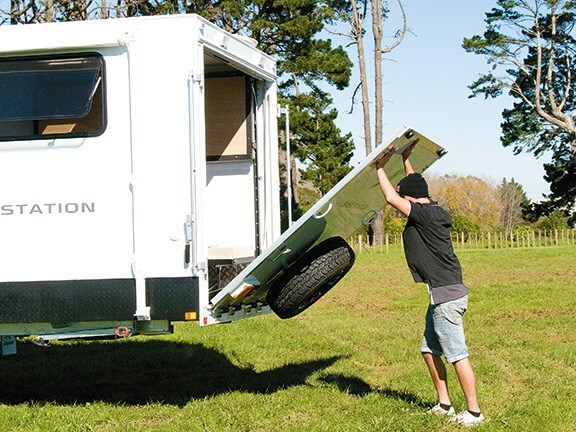 It is as though part of a camper trailer has been grafted onto the front of the caravan. 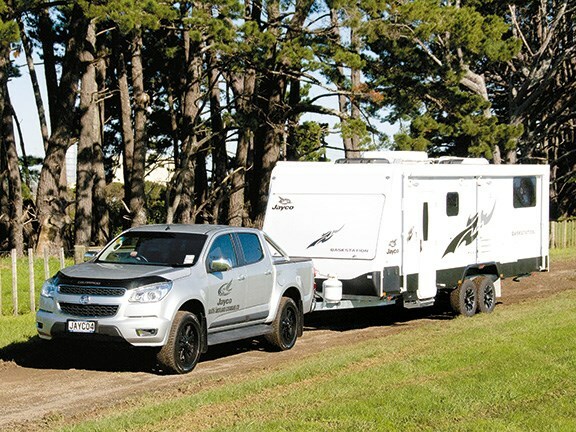 Jayco uses this set-up in its Expanda range and it has proven popular because it offers a double bed while keeping the overall length to a minimum. To extend the bed, you first have to lift up the external cover. When raised, this cover provides protection from sun and rain. The folding bed is a very good use of space and, to my mind, a better option than converting the lounge into a bed each night. Video and audio entertainment options are not overlooked. The Fusion Premium CD/DVD/radio system with external speakers and app functionality will appeal to music buffs. It is top of the range equipment with a mighty sound. For those who prefer to chill out watching TV or a DVD, the Sphere LED TV with built-in DVD player and Freeview should do the trick. 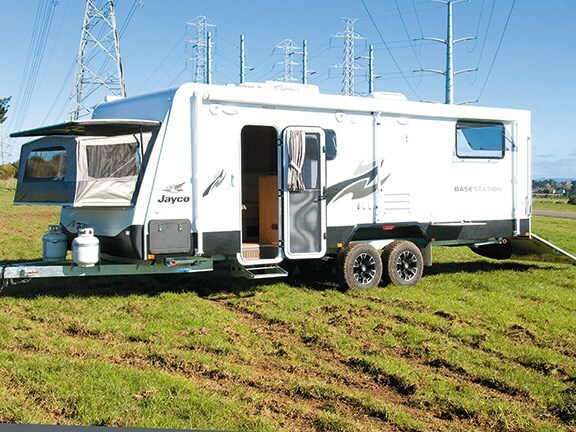 The Toyhauler Basestation body construction is typical Jayco – solid and hardwearing. The Outback version has a number of features that enhances its 'off-roadability'. The hot-dipped galvanised steel box-section chassis is stiffer than the standard chassis, the electric brakes and drop-jacks are heavier duty, and the sides are protected with alloy checkerplate. The 16-inch alloy wheels are fitted with 245/70 R16 tyres filled with nitrogen for superior performance. Jayco's J Tech independent wheel suspension replaces the standard beam axles. The Toyhauler Basestation 23.73-6 OB is a heavy beast, with a tare weight of 2730kg plus 650kg payload allowance, so it will require a tow vehicle with around 3500kg towing capacity. Jayco fits the Toyhauler with AL-KO's electronic stability control (ESC) system. Jayco's Toyhauler range appeals to a small segment of the motorhome market, but those who buy them enjoy them. The unlikely mixture of leather upholstery and boilerplate patterns will be with us for some time to come. The Jayco Toyhauler Basestation 23.73-6 OB, as reviewed, retails for $82,000 on the road and the standard models start at around $70,000. 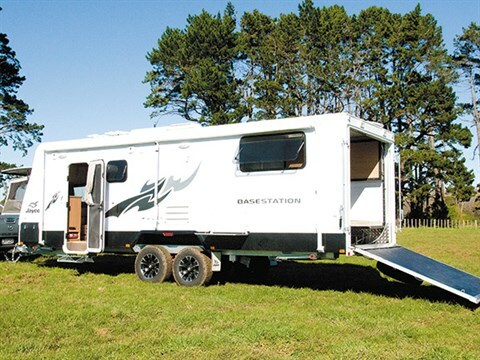 For more information contact South Auckland Caravans on (09) 2713434.